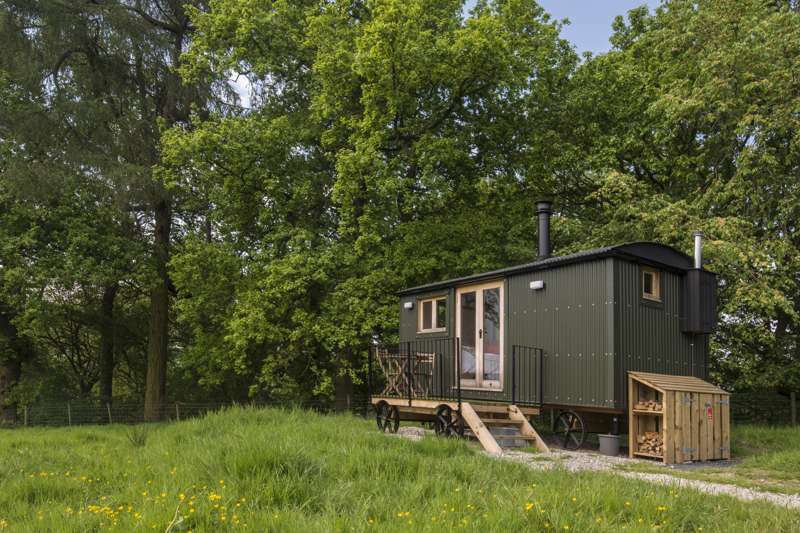 Luxurious and bespoke, this traditionally built oak-framed shepherd's hut houses a supremely comfortable king-size bed, en-suite bathroom, log burner and fully-equipped kitchen. 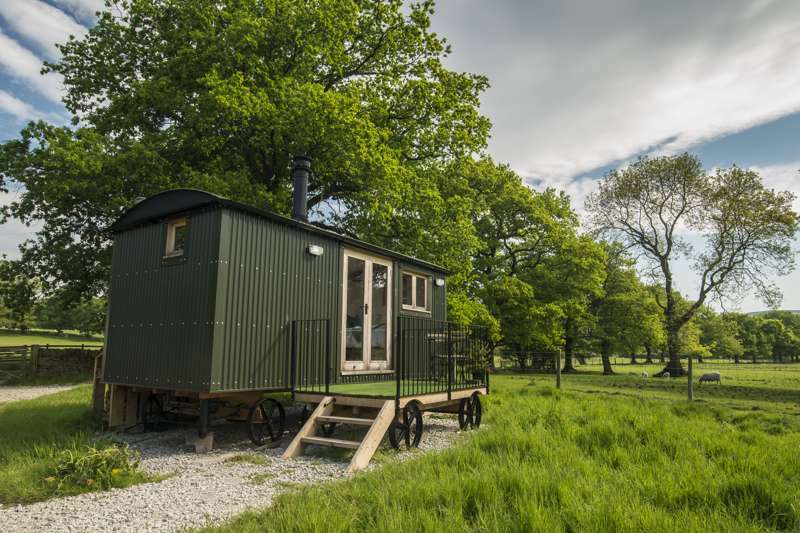 Nestling in the tree line on the perimeter of a small private field; it has stunning views down over the Dane Valley and across to the Staffordshire Peak District. 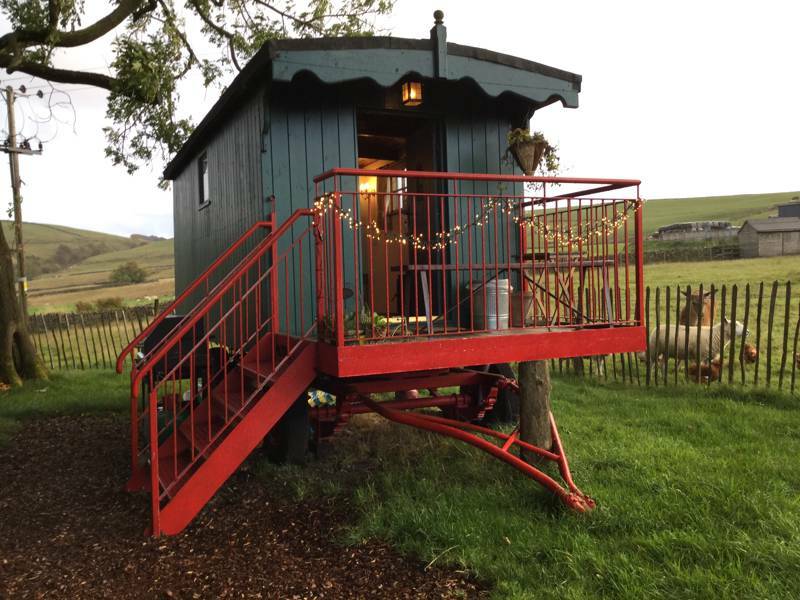 Delightful, traditionally-built bespoke oak-framed shepherd's hut nestling in the tree line on the perimeter of a small private field with stunning views down over the Dane Valley and across to the Staffordshire Peak District. 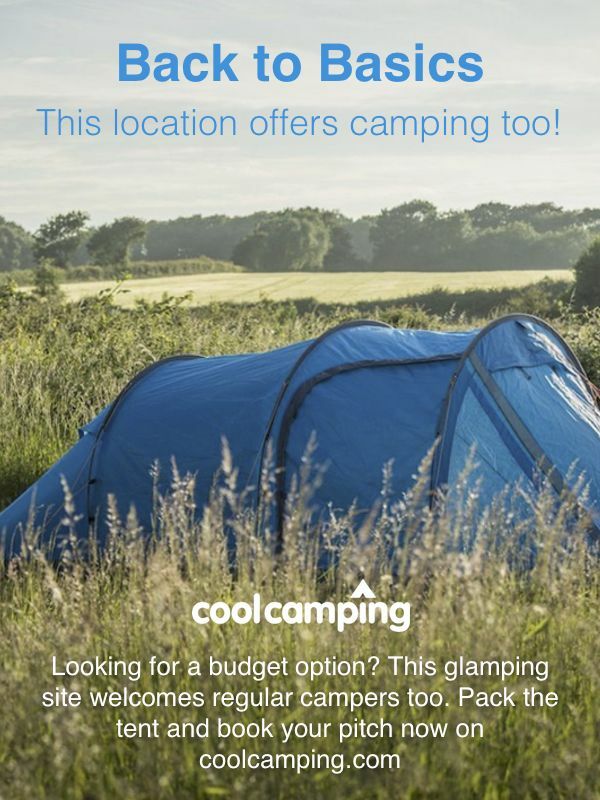 Featuring a king bed, full-sized ensuite and log burner. Situated one mile off the beaten track and nestled in a lush green valley, Whitelee Farm offers a wonderful opportunity for those seeking to get away from it all. Continuous investment in traditional features such as dry stone walling, hedge laying and protection of ancient woodland ensures that the farm and its habitats are nurtured for future generations to enjoy. Set inside the UK'S first National Park, Whitelee Farm is a working farm set over 340 acres of prime Peak District National Park farmland. A rich and diverse landscape ranging from pastureland to ancient forest (around 40 acres of the farm) we also border the River Dane along the Southern edge of the farm; giving private access to one of the reputedly fastest rising and falling rivers in the UK. We are extremely proud to be one of the original farms supporting the Dane Valley Woodland project designed to actively manage woodland and specifically Oak. The Dane Valley has one of the highest concentrations of semi natural and ancient woodland in the Peak District for example we have one of the oldest Oak trees within a 40 mile radius on the farm drive. In 2016 we planted 3,500 saplings as part of this project and our own woodland management plan. Across the farm mixed livestock (sheep, dairy and beef herds) graze on the pastureland for much of the year; enabling us to produce meat products of such note that we supply a well known premium retailer with our products. Working in such spectacular scenery is a real privilege for our family and we are delighted that we are now able to share this unique environment with others with the installation of two traditional Shepherd Huts: Dane Valley and Hen Cloud. Each sleeping 2 adults, the bespoke Shepherd huts have been individually designed to maximise their location following approval from the Peak District Planning authority. Sensitively built in order to be as much in keeping with their surroundings as possible, each hut is oak framed, clad in wriggly tin and lined with sheeps wool. Featuring many luxuries of a domestic environment; guests always comment on how much has been fitted into a small space. We wanted to create a luxurious environment that put access to the wild on the doorstep for all and we look forward to welcoming you to see how this has been achieved. For latest availability and best prices for Whitelee Farm Shepherd Huts, please use the Date Search above. The 2 huts are self contained units with electricity and served by spring water. En-suite shower room features full size shower, heated towel rail, flushing plumbed toilet and sink. Custom-built kitchen with granite tops including small fridge with ice box, gas cooker and gas hob. Includes frying pan, griddle pan, 2 x saucepans, cooking utensils and knives, cutlery, kettle, oven gloves, foil, cling film, and bottle opener. Dining area for 4 includes plates, cutlery drink mats, salt and pepper. Log burner included – always ready laid for guests and sufficient logs available for the entire stay. Oak flooring throughout. Veranda with outside seating. Explore the Peak District via the multitude of scenic walking and cycling routes. Iconic rock formations like and Luds Church and The Roaches are nearby and the farm lies on Route 17 of the Peak District Boundary Walk, which takes you round the entire national park. The River Dane runs through the farm so you can enjoy some wild swimming. Charming spa town Buxton is around 20 mins drive away, while idyllic Bakewell is around 45 mins away. For some true r’n’r, Mill Wheel Spa (01538 300296) is 3 miles away. Some of The Midlands’ most popular attractions are all under an hour away including Peak Wildlife Park (01538 308880), Chatsworth House (01246 565300), Jodrell Bank Observatory (01477 571766) and Alton Towers (0871 222 3330). Ingredients for making your own cooked breakfast can be pre-ordered (continental option available). BBQ packs and picnic hampers are also available to buy in season and bespoke locally-sourced dining packages can also be arranged for special occasions (contact the site in advance for more details). 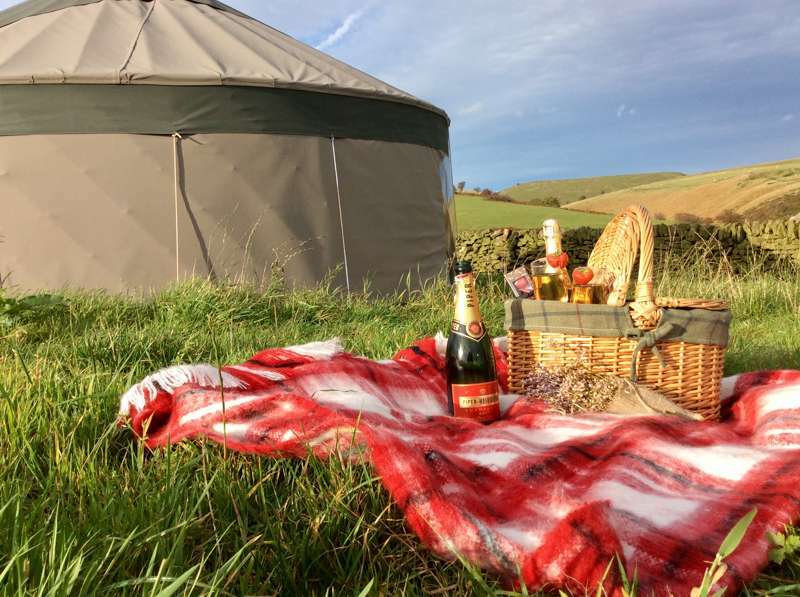 There’s plenty of artisan produce to sample in the local village – Wincle Beer Company (01260 227777) runs regular tasting tours and the homemade ice-cream at Blaze Farm (01260 227229) is a local institution. If fish takes your fancy, catch-and-keep Danebridge Fisheries (01260 227293) in the local village of Wincle stocks trout-filled lakes for all ages and abilities. The nearest local pub is The Ship Inn (01260 227217) within walking distance. The Rose & Crown (01260 227232) in Allgreave boasts beautiful views over the Dane Valley and The Ryles Arms (01260 252244) at Higher Sutton is famed locally for its meaty menu. The award-winning Sutton Gamekeeper (01260 252000), 480-year old Sutton Hall (01260 253211) and The Lazy Trout (01538 300385) at Meerbrook are all around 4 miles away. Please use postcode SK11 0QE – this is slightly different to the farm postal address; but most sat nav systems will take you to the wrong location if you use the postal address. The drive is a mile long and single track for most of the way. Continue over 2 cattle grids then down a steep hill and immediately back up the other side. As you travel along a straight part of the drive you will turn to the left to go past a pond where you will see some large agricultural farm buildings ahead of you and the shepherd huts in a field on your left. Please head through that gateway; where there are 2 parking spaces just the other side of the wall on stoned ground to the right of the entrance. The nearest train station in Macclesfield, 7 miles away (20 minutes to Manchester and 1hr 40 mins from London Euston). Buxton train station is 8 miles away. If you wish to travel by public transport then a taxi will be able to bring you from any of the bus or train stations. 2 bespoke shepherd huts (each sleeping 2).